Maximum size: about 6 mm. 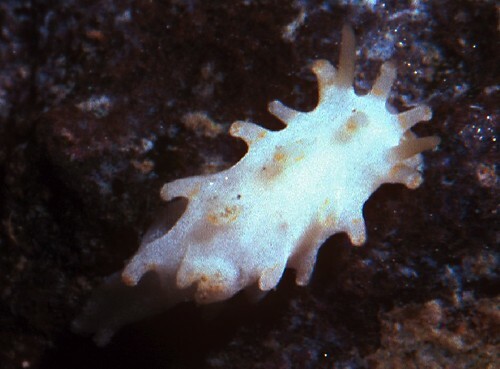 Identification: This is a cream species with long papillae that have spiculate tips. The papillae have pale orange rings on their bases and pale orange tips in some animals. Natural history: We've never found Aegires lemoncello on Maui but Scott Johnson reports finding several at moderately protected to highly exposed rocky sites on Oahu and Robyn Smith recently found one in a cave at about 15 m (50 ft) on the Big Island. Taxonomic notes: First recorded in Hawaii at Makua, Oahu by Scott Johnson on Sept. 25, 1978. Photo: Scott Johnson: about 6 mm: Makua, Oahu; Sept. 25, 1978.